Philips LED 65W Indoor Flood. Energy savings and long life. Soft white diffused light. Dimmable. Instant-on light. Mercury and RoHS compliant construction. Similar size and shape as regular bulb. Will not fade fabrics or furnishings. Ideal for both accenting and general room lighting. Medium base (E26). Philips LED 100W Household bulb. Energy savings and long life. Soft white light. Instant-on - delivering beautiful, consistent light. A19 shape - similar size and shape as a traditional incandescent bulb. Emits virtually no heat and will not fade fabrics or furnishings. Ideal for table and floor lamps. The every day affordable LED bulb. Philips LED 40W Household bulb. Energy savings and long life. Soft white light. Instant-on - delivering beautiful, consistent light. A19 shape - similar size and shape as a traditional incandescent bulb. Emits virtually no heat and will not fade fabrics or furnishings. Ideal for table and floor lamps. The every day affordable LED bulb. 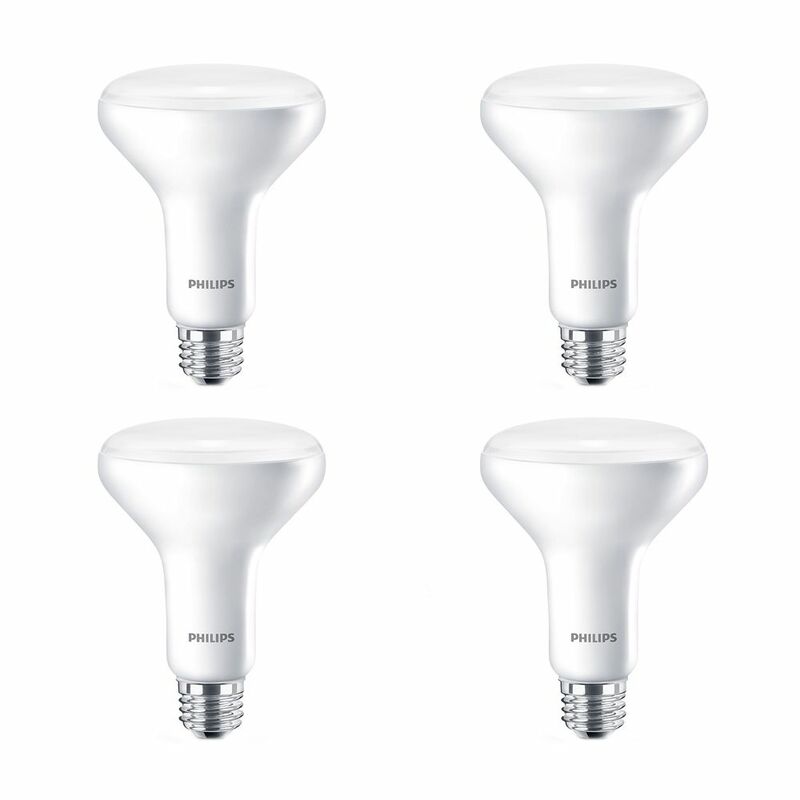 Philips LED Household 3-way bulb (5/9/20W replaces 40/60/100W). Energy savings and long life. Soft white light . Light diffuses in all directions - Omni-directional light. Instant-on light. Mercury and Rosh compliant construction. Will not fade fabrics or furnishings. Ideal for table and floor lamps. Philips LED 35W equivalent MR16 indoor flood bulb with dimmable warm glow light (2700K - 2200K). As light is dimmed, the colour temperature transitions from 2700K to 2200K creating a warm glow replicating incandescent lighting. Fully dimmable and with a GU5.3 base. This bulb replaces your current 50W halogen MR16 bulb. Energy savings and long life. Soft white light. Dimmable. Instant-on light. Mercury and RoHS compliant construction.Will not fade fabrics or furnishings. Ideal for both accenting and general room lighting. LED 65W BR30 Soft White (2700K) - Case Of 4 Bulbs Philips LED 65W Indoor Flood. Energy savings and long life. Soft white diffused light. Dimmable. Instant-on light. Mercury and RoHS compliant construction. Similar size and shape as regular bulb. Will not fade fabrics or furnishings. Ideal for both accenting and general room lighting. Medium base (E26).